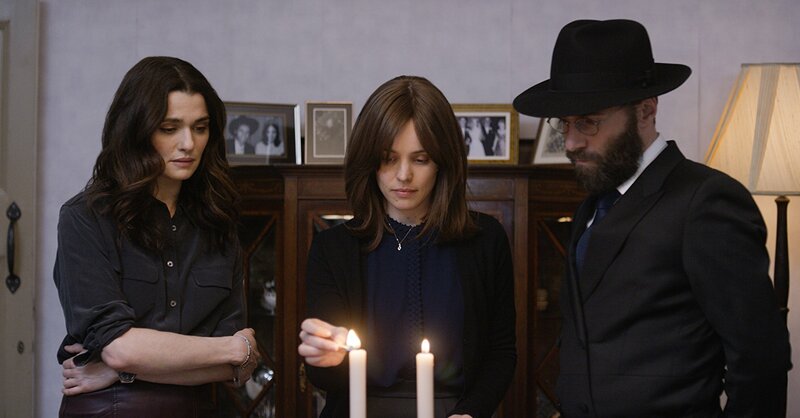 Disobedience is a quiet, strong movie that pierces convention in many ways. The risks it takes are delivered with subtle use of gestures and voice. Director Sebastian Lelio, his team, and a fine cast have delivered an unusually complex story in a provocative way. Ronit, a professional photographer in New York, has returned to London’s orthodox Jewish community to attend the funeral of her father Rav Kruschka (Anton Kesser). She is greeted with widespread disdain by those who believe she deserted him. Two old friends welcome this woman they once knew so well. It is the three of them who will deliver the complicated emotions of the movie with quiet skill that holds our attention. Each of the women delivers her prevailing philosophy of life. Ronit, who couldn’t stand the conformity of the orthodox community, fled to New York to escape her resentment. The anger resurfaces as soon as she returns to London. Esti, who shares so much of Ronit’s bright spirit, falls into deep confusion – to stay in loyalty to husband and orthodoxy or to flee with her friend. Esti, after all, is married, in a restrained and acceptable kind of way, to Dovid who is a rising power in the consuming culture of the orthodox faith. It is all heightened by the affair, both emotional and physical that unfolds between Esti and Ronit. In lesser hands, all this could easily have been a genuine misfire. Delivery without histrionics by Rachel Weisz, Rachel McAdams, and Alessandro Nivola, leaves us free to sink into their dilemma with genuine curiosity. This review was posted on May 13, 2018, in Drama, Romance. Bookmark the permalink.